Mt Sterling is a small town on a small hill with two claims to fame. When the local mayor tried to outlaw lying in 2003, New York Times sent a reporter to AJ's Bar & Grill to interview locals, and other media outlets picked up the story nationwide. The second claim to fame is the gigantic tenderloin known for "miles around" in the hill country just north of the Missouri Border. 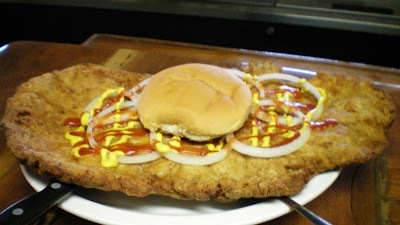 A local newspaper article compared AJ's Jumbo Tenderloin to the Gunderburger in terms of local legendary giant sandwiches. I had to check this place out after someone from the local tourism office pointed me in the right direction. Location: 101 Elm St. in Mt. Sterling (population 36), in Van Buren County, Southeast Iowa. This is about as far out of the way as it gets. Directions: Highway 2 is the main road through the southern tier of counties in Iowa. Take County Road W20 4 miles south to Mt Sterling. Follow the sign pointing to AJ's. Online at: try the Villages at Van Buren website, one of the best local tourism site in Iowa, HERE. 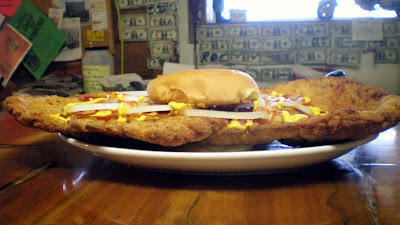 The Tenderloin: This one is significantly bigger than the plate it is served on. 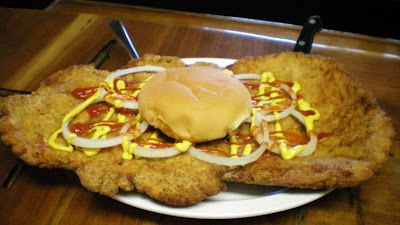 It has the usual attributes of the super-jumbo tenderloin, extreme thickness in some parts, edges a little crispier than the middle. Juice bursts from the center when a fork is stuck inside. The fork and knife that give the picture scale are necessary to cut the edges off and make the thing workable. The breading seems to be a double dip of egg wash and seasonings before deep frying. They put the ketchup on the mustard on for me, but I would not have added this much ketchup. Overall 8.5 out of ten, worth the trip off the Highway. Also on the menu: There is a smaller tenderloin, a tenderloin bits appetizer, along with the usual burgers and fried stuff. Service: One lady was working the bar while a guy in back cooked. I think they were the co-owners. Ambiance: This is a Hunters Lodge with exposed concrete floor, wood paneling and particle board walls, along with taxidermy animals of all local varieties mounted on the walls between beer signs. The windows have a great view overlooking the Fox River Valley, and its acres of protected wetlands and tree groves. Final Thoughts: Any person who has traveled most of Iowa would be surprised to see how much land isn't being farmed when driving the county road into Mt. Sterling. This small part of Iowa is turning into a hunters paradise, with hundreds of acres of fallow fields, and shallow water wetlands and wooded areas filled with animals. 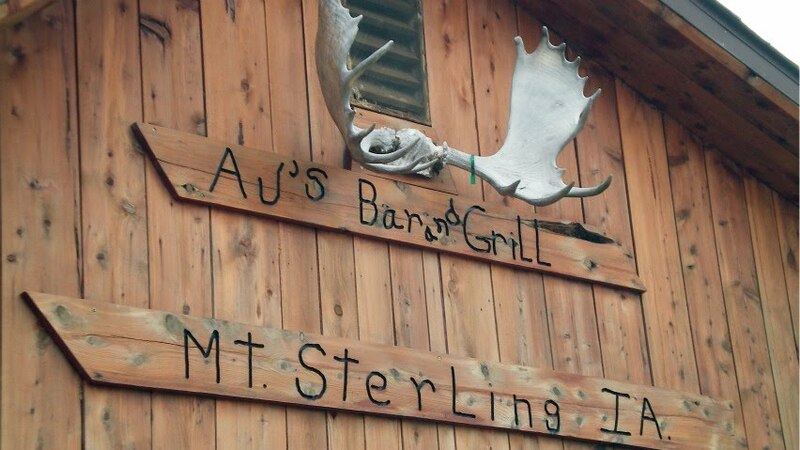 AJ's Bar & Grill and the rest of Mt Sterling is a welcoming place for these people. The town with just 36 people, and which may have had more dogs than people at one point, seems to be hanging on. 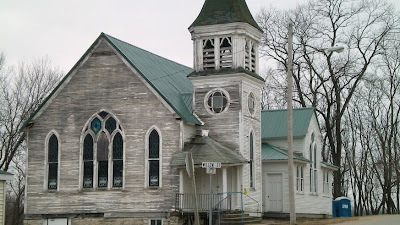 Check out the antique church on the way into town, the locals have been trying to maintain it for a while now. 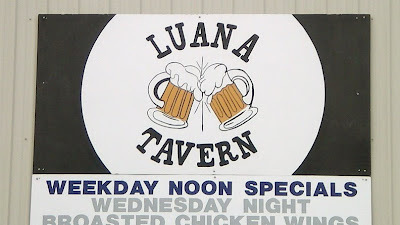 The Luana Tavern answers the phone by stating "Luana Tap". I get the idea this place opens at 8 in the morning and stays open until bar closing time. 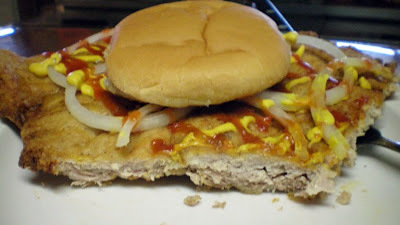 Unfortunately, they were sold out of breaded pork tenderloin sandwiches when I arrived at 1:45 in the afternoon. I asked about their grilled tenderloins, and they were sold out of the plain grilled tenderloin and the Mesquite BBQ grilled tenderloin. The only thing they could offer me was the Apple Cinnamon Grilled Tenderloin, and it turned out alright despite not being my first choice. If they are selling out of three different sandwiches at lunch time, they must be doing something right in this tiny burg in Northeast Iowa. 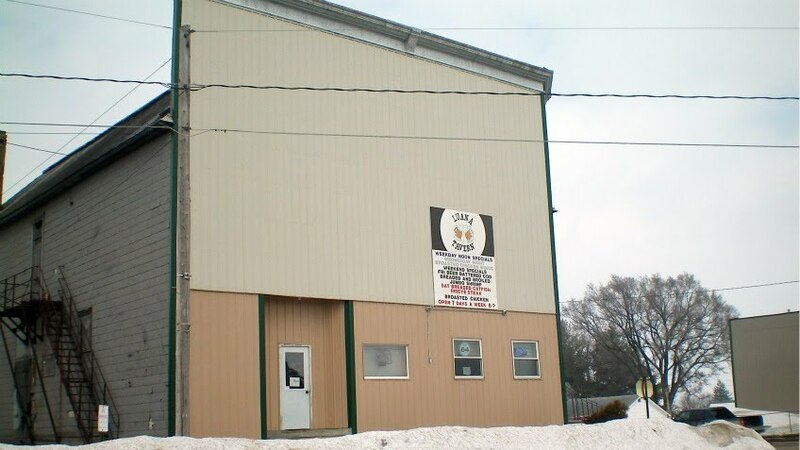 Location: 301 Main St. Luana, Clayton County in Northeast Iowa. Directions: Highway 18/52 crosses this part of Clayton County, turn north at the gigantic Luana Bank building and cheese factory and take Old Highway 52 into town. The Apple Cinnamon Tenderloin: The meat felt like it had been lightly tenderized, with most fat trimmed except for a tiny bit on the edges. 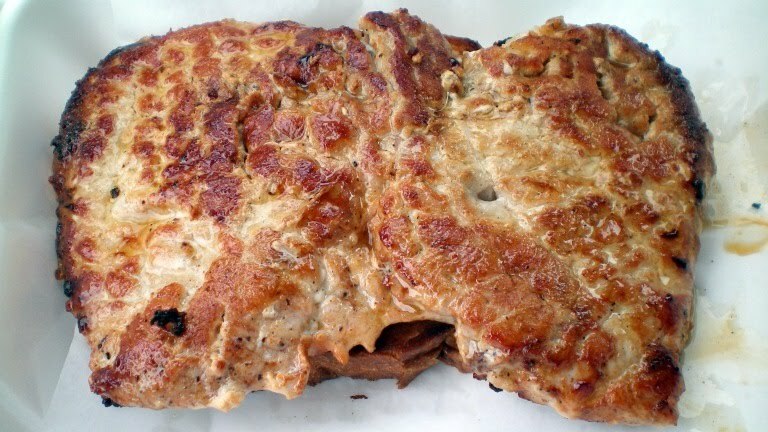 This kind of grilled loin feels like it has tons of juice, and it runs out even forming a little puddle in the to-go box. The color ranged from the white of the pork loin to the good brown seared parts and a few darker bits. What sets this one apart is the aroma of pork and apples that filled my car for hours. That was something different. 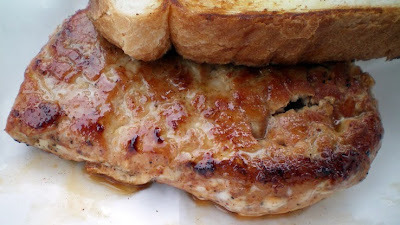 The flavor of the marination didn't overpower the classic fresh pork taste. Served on Texas Toast with butter on both sides, which adds calories and some crispitiness. 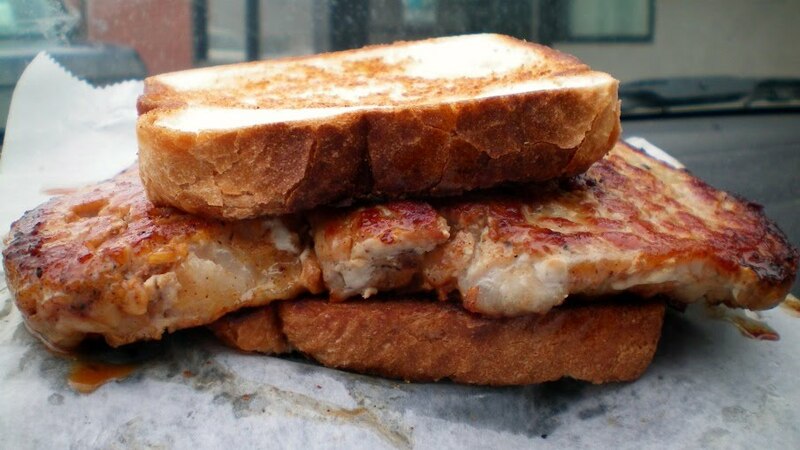 This is a tasty sandwich, Overall 7.5 out of ten. Also on the menu: the Luana Tavern has a daily menu with the basics like a breaded loin, burgers, chicken and other stuff. 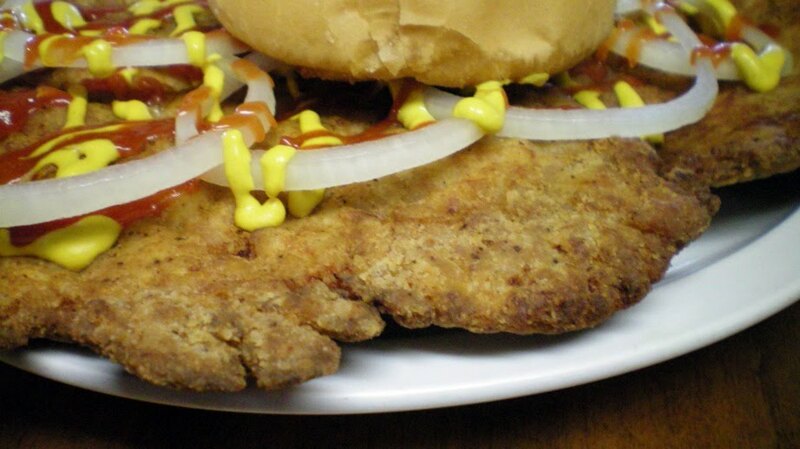 There are some out-there daily specials, like frog legs, broasted wings, hand breaded fish or sirloin steak. Service: There was one lady running the bar and waiting tables, with a guy cooking in the back. Ambiance: This giant building at the main intersection of Luana has followed the path of the town, from once being an Opera House, later a dance hall, and now a tavern with a dining room. The decorations are the usual "welcome hunters" sign, racing posters, beer signs, and bar games. There are tables and a bar for seating. Final Thoughts: Its just seems out of place to pick up a sandwich that tastes like something from a pretentious big city bistro or gastropub in a town like Luana. The owner/operator/cook makes this place work, and it was packed with locals when I visited. I just wish they had a breaded loin in stock when I stopped by.